In a new memoir, the former head of IKEA Russia describes an experience not altogether unfamiliar to foreigners living long-term in the country. Years and even centuries have gone by since Custine made his way from Moscow to the frontiers of Siberia, but the picture of Russia abroad remains essentially the same. 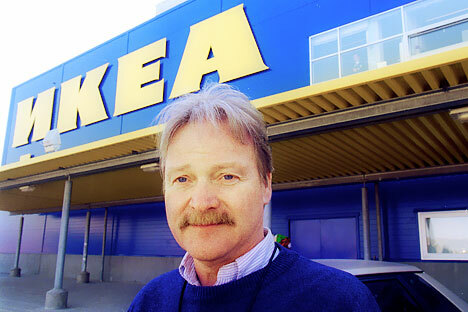 “People in the West know astonishingly little about Russia,” writes Sweden’s Lennart Dahlgren, who worked for close to a decade in Russia as the head of IKEA. “We tend to take the stereotypes about this country as the reality. We have an outdated mold with which we try to cast our image of Russia, when in fact it is made up of a mosaic and is constantly changing.” Dahlgren, too, has published a memoir: Despite Absurdity: How I Conquered Russia and How It Conquered Me. Anyone expecting another manual on how to succeed in sales will be disappointed. This book, published last year in Swedish and Russian, contains nary a word about business. Its value is in something else, in its attempt to explain to the reader why one would do better not to approach Russia with the standard set of myths and stereotypes. “Those who call themselves Russia experts usually don’t understand the first thing about it,” writes Dahlgren. “People who say they don’t know much about Russia come much closer to understanding it.” Thanks to Dahlgren’s book, Westerners may know Russia a little better. Like most of IKEA’s managers, Dahlgren began with a distinctly negative attitude towards Russia, the result of negative information in the media. When he first came to Russia on a business trip in the early 1990s, he brought two boxes of children’s clothes for the throngs of poor Russian children supposedly roaming Red Square. On one of his free evenings he and a friend set out for Red Square with a burning desire to bring happiness to those little Russian ragamuffins. How surprised and even disappointed they were to discover that the children they met were well-dressed and mostly accompanied by parents. Cold and exhausted, the two Swedes decided to go on the attack and force their ill-fated boxes on anyone who would take them. Most people politely refused the boxes, but one person threatened to call the police. Dahlgren never brought another box of second-hand clothes to Russia again. Business, too, was not smooth sailing at the outset. IKEA managed to launch stores in Russia only on its third attempt. The first try was derailed by the collapse of the Soviet Union, the second try by the war between the Russian government and Parliament. The third time around, just as construction was about to begin on the first IKEA store in Russia, the ruble collapsed. You would think that, from the point of view of Western logic, a person had better not do business with a country like ours. Western logic, however, doesn’t work in Russia. But the old saying does: “Nothing ventured, no Champagne.” Dahlgren became convinced of this through his own experience. Almost half of his book is devoted to the long-running tug-of-war between IKEA and local authorities in the Moscow Region. The Swedish company was supposed to build a bridge over the Leningrad Highway so that customers could get to the store more easily. First they received permission to build the bridge, then that permission was rescinded on a pretext. Soon traffic on the Leningrad Highway was backed up for kilometers and the on-again off-again bridge was back on again, but in the wrong direction. Bureaucratic logic like that would drive anyone up the wall. Dahlgren does not say so in so many words, but he does imply that the problem could have been easily solved with money. It is no secret that the local authorities in many regions of Russia see the arrival of a major Western company as one way to beef up the local budget and solve social problems. IKEA ended up having to contribute $5 million to the development of children’s sports in the Moscow Region. Of course only a very large concern has the confidence necessary to engage in a protracted battle with the local authorities. Others often give up and abandon the market. IKEA did not give up and here’s the result: In less than 10 years in Russia, 13 gigantic malls were opened in 10 cities along with an enormous distribution center, and three manufacturing complexes began operation. “Where else could you achieve such impressive results over such a short period?” exclaims Dahlgren. Incidentally, it was in Russia that IKEA tested its new business model. In Russia, IKEA began opening not just furniture stores, as in other countries, but enormous shopping and entertainment complexes. Their success exceeded all expectations: The first complex of this kind became the most visited in the world just two years after it opened with 50 million visitors annually. Having lived in Russia for a decade, Dahlgren found an explanation for Russia’s negative image in the West: clearly it is in someone’s best interest. “I noticed fairly quickly that many Western businessmen in Russia lead a merry life full of affairs with Russian beauties and wild drinking sprees — this hardly promotes success in business.” So what do these relaxed businessmen do? “There is a huge temptation to live as one pleases, and then to attribute any failures to the ‘horrors of Russian reality’: the mafia, corruption, pressure, threats,” writes Dahlgren. The boss will think that his poor underling was knocking himself out under inhuman conditions, forgive the losses and pack him off to a calmer country for a rest cure. Social benefits for staff in the Russian offices of Western firms are substantially higher than for staff in offices elsewhere. “I know for a fact that I will always miss that crazy space full of love, without fully understanding why,” writes Dahlgren. “Russia is a drug and I’m addicted to it.” Now that’s love Swedish-style!